With a promise to give you a fresh new look, Blackberry has brought this shirt. It comes in a printed pattern that renders it trendy, while the regular collar and full sleeves enhance its design. 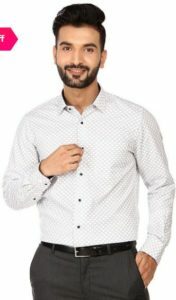 This shirt is suitable for both Formal and Casual Wear. Buy the product worth Rs.1,995 at Rs.997 only at Tatacliq.